My baby. 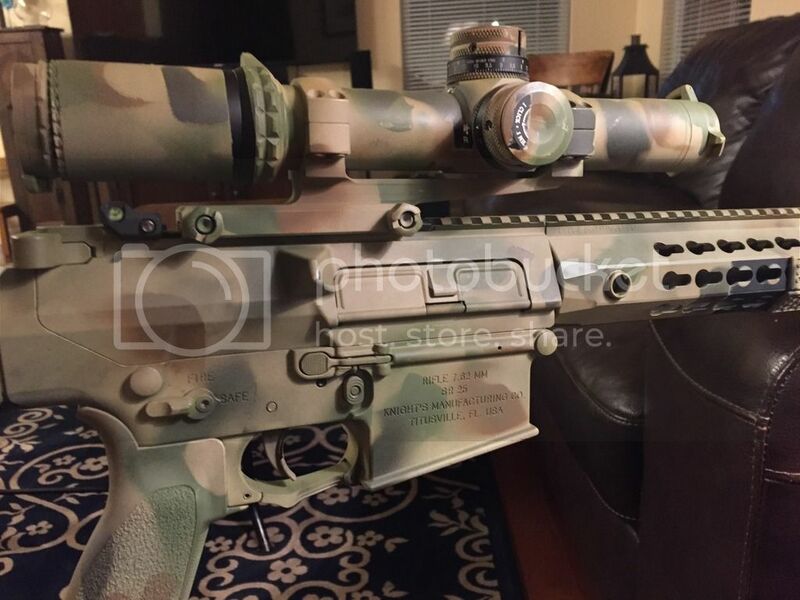 KAC SR25 ACC with Leupold MK8 w/H27 reticle. Changed a few things out. Geissele Hi-Speed National Match trigger, Magpul CTR stock, BCM Gunfighter Mod 3 grip, Silencerco ASR brake with Saker 762 can. My favorite do-all rifle. Last edited by tpe187; 03-09-17 at 08:24. My baby. 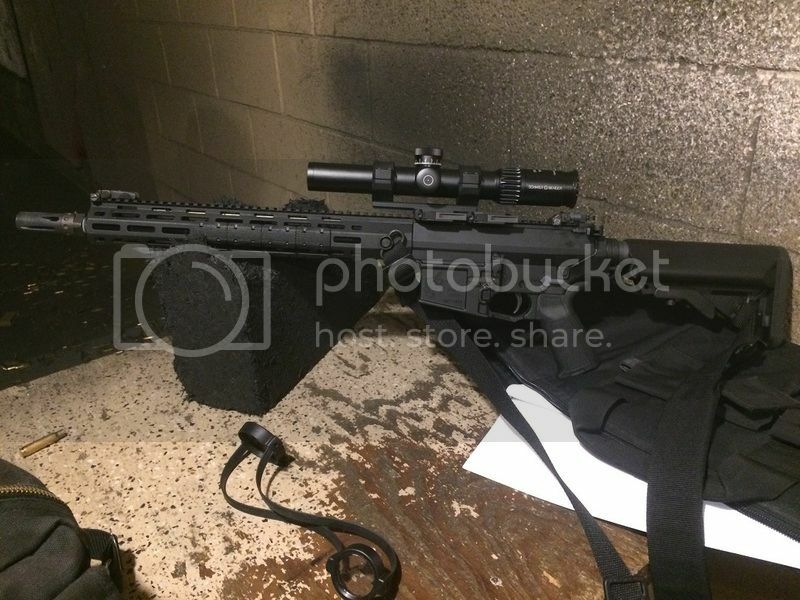 KAC SR25 ACC with Leupold MK8 w/H27 reticle. Changed a few things out. 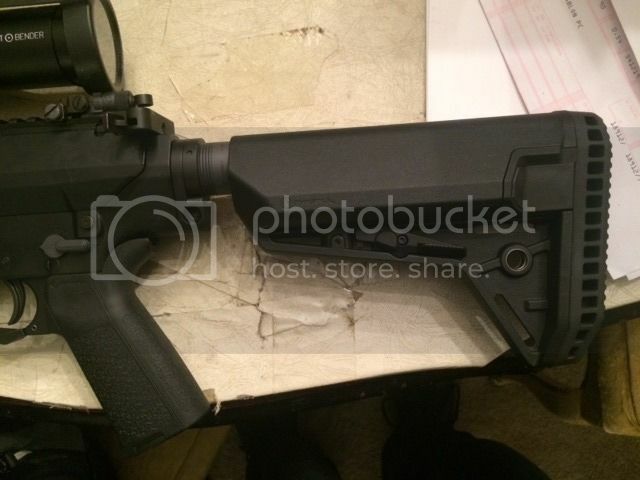 Magpul CTR stock, BCM Gunfighter Mod 3 grip, Silencerco ASR brake with Saker 762 can. My favorite do-all rifle. Awesome setup. 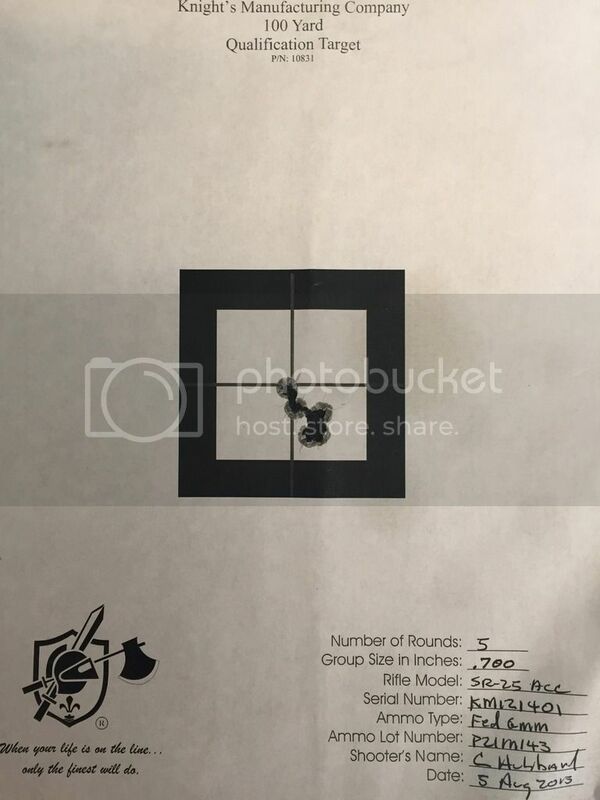 You have a pic of that whole rifle? I don't know if I have the balls to paint mine, but that looks darn good. The SR-25 E2 ACC I have is a work in progress. I selected the flash hider since I do a lot of shooting in a confined indoor range and find extra muzzle blast to be objectionable. Scope is S&B short dot 1.5-8 power with CQB reticle--I was interested in an optic that was good from close in on out. I would have rather had the scope in 1-8 power, but the reticle is not available in that model. Even tuned down to the lowest power (1.5) with the illumination on it is very quick and very daylight visible. Rail covers are Magpul type 2 Mlock covers. Tpe.. What kind of POI shift are you getting with your suppressor at 100yds? Also, curious as to what distance you zero your rifle with that CQBSS? I tend to use a 100 zero for anything that's not a 5.56. Those get 50yd zeros. 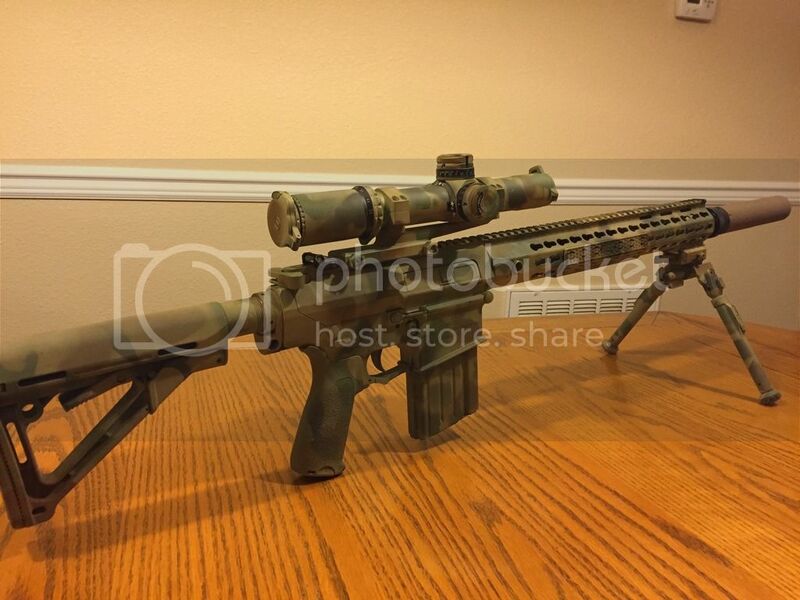 Originally Posted by Ed L.
NICE RIFLE! I love the SL-S and have put them on 6 rifles already. Notice any difference with that .7 pad? and would you say that puts you one more position on the stock, or more like a half? Im pretty picky about that..
Last edited by Jwknutson17; 03-09-17 at 16:23. 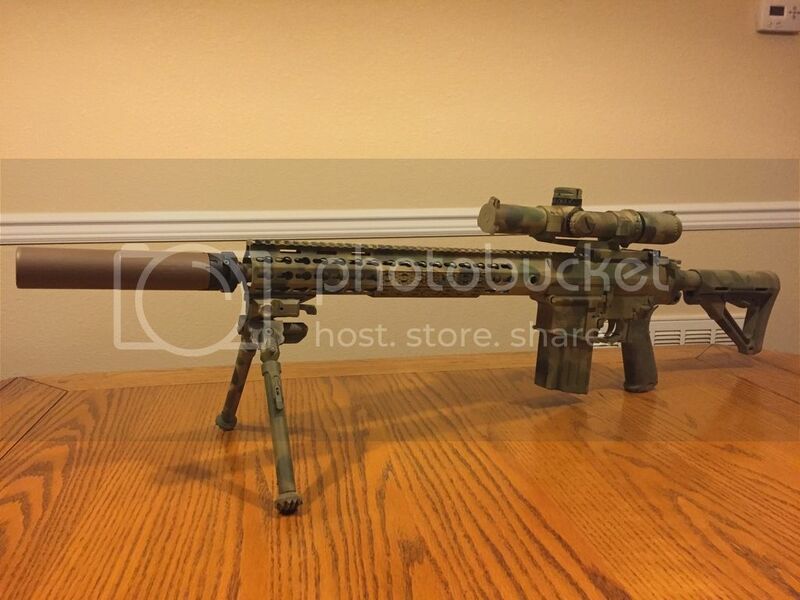 I have not fired it with the new stock set-up yet. Stay tuned . . . Need to work on the POI change with the can. Can came in right before my deployment last year and I've been messing around with the bolt gun since I got back. I've only run it on some steel. 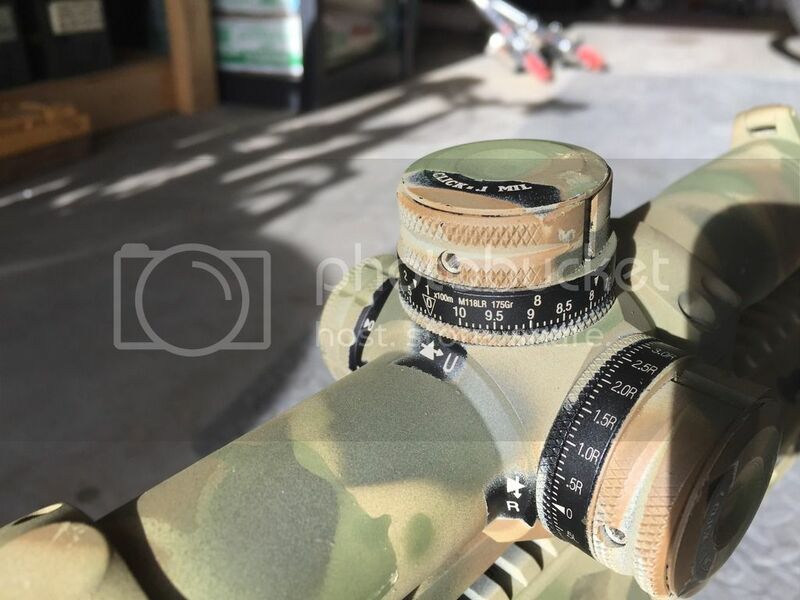 As to the zero, I zero at 100m and the great thing about the CQBSS is that it is calibrated for M118LR so you can dial range or if using an app/data card can dial mils. Combined with the H27, its damn near idiot proof. I still need to true it, but its been on for steel from 100-450m. 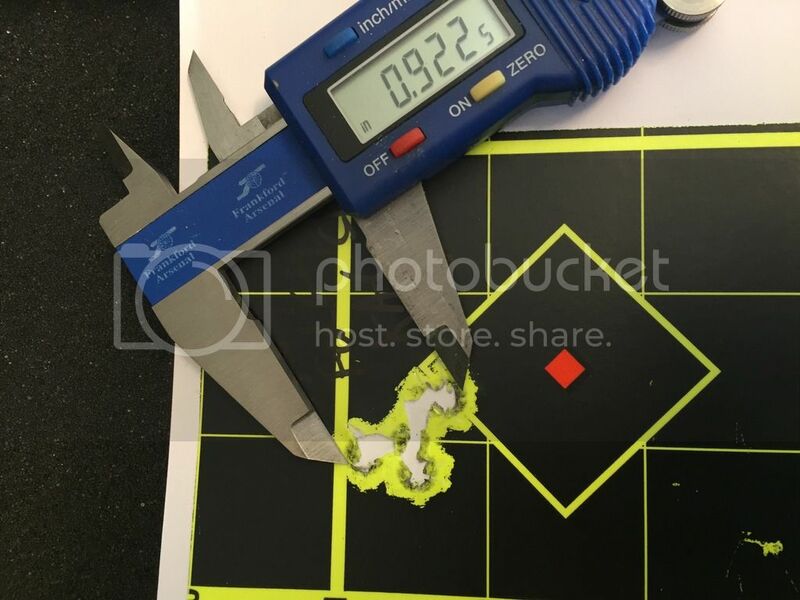 Factory target with 168gr FGMM, and a group I shot from bipod with 175gr FGMM. Last edited by tpe187; 03-09-17 at 17:34. Excellent shooting! And thanks for your service! For some reason my H27 CQBSS didnt have that M118LR turret inset in it. Leupold sent me one free of charge though. So still have to swap that in there. .700 is what I hope for on my APC! I would take 1inch all day on the ACC. Your just south of me, if your in the Springs? Yep, on Ft Carson. From what I've seen online, my ACC seems to be on the more accurate side for the model. That it is!! I was hoping that I could have cherry picked them out of a bunch, but I have bolt guns for that and 1moa is plenty good for my needs on a gas gun. I ordered a dial from Leupold calibrated to 168gr Gold Dot, 168gr Federal LE308TT2, and 168gr FGMM, out to about 800y, it's only 12" off across the three of them, largest delta. The dial is spec'ed for a 100y zero, as that's what most ranges around me are. 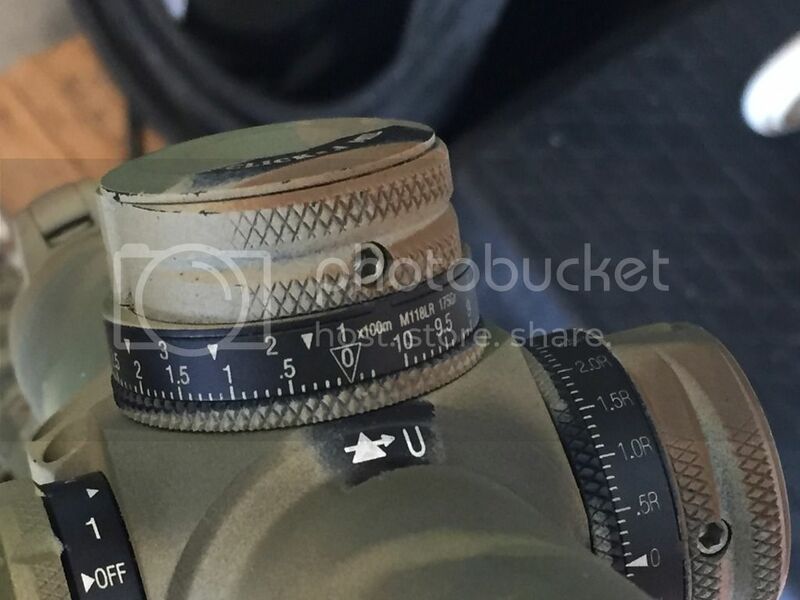 Just throwing that out there...For $80, Leupold will make you any dial you want for your MK6. I would have loved to have a MK8 with the H27, but I have a MK6 with TMR-D, and honestly, I might be happier for all I know, that CQBSS is heavy on an already "heavy" gun. (I want to use my ACC like a big fat carbine! Hopefully buying early next month).